Cozumel, Mexico is a blue water paradise. Divers and snorkelers from all over the world come to experience the Mesoamerican Reef System, discovered by Jacques Cousteau in the 1960s. Cozumel, in the Mexican Caribbean, has grown up since then, and gained in amenities such as the Jack Nicklaus Golf Course and numerous luxury, all-inclusive hotels. One of the seemingly undiscovered changes in Cozumel is the quality of the food and the restaurants. It’s not just tacos, chips, and salsa anymore! Now there is true culinary artistry for traveling foodies to enjoy. I’ve been visiting Cozumel for over 20 years, and I found these restaurants through local people; they are a bit off the beaten path. La Cocay (http://www.lacocay.com/eng/menu.asp), a Mediterranean restaurant, is three blocks off the main coastal road on Calle 8. The location is nondescript, and the last place one would expect to find such a culinary gem. Just as you begin to think you must have the wrong area, the lights of the La Cocay dragonfly attract attention. (La Cocay means dragonfly in Mayan.) The inside seating and bar has a lovely atmosphere, but my favorite place to sit is in the garden. The owner, Kathy, welcomes each diner personally to La Cocay, and the wait staff wastes no time in arriving at the table with menus and offering to take drink orders. La Cocay is not a let’s-get-our-food-and-go restaurant, it is an evening of fine dining. Appetizers include tapas like Goat Cheese Stuffed Empanaditas with Mango Chutney and Phyllo Rolls with Cream Cheese and Black Cherry Sauce. The Napa and Florentina Salads are a must, and the entrees, with specials daily, are simply fabulous. The finishing touch is the Chocolate Torte, a soufflé which needs to be ordered with the meal since each torte is prepared to order. 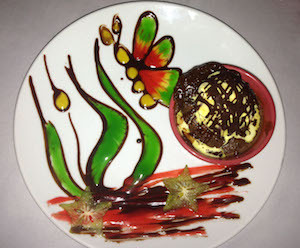 All desserts are served with artistic renderings by the chefs. La Cocay is not a “touristy” restaurant, but an establishment that would be successful in any part of the world. Buccanos at Night (http://www.buccanos.com/menu.htm) is not a place I had heard of until just recently. It was highly recommended by a friend of mine on the island. 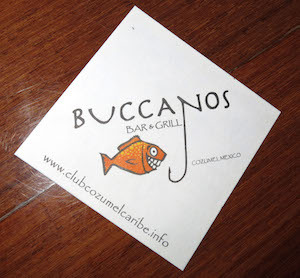 We were lucky to get reservations because Buccanos at Night is always fully booked. Located on the north side of the island, Buccanos is a beach club by day, serving dinner only on Friday and Saturday nights. Set on the edge of the ocean, Buccanos at Night has an almost ethereal ambiance. I loved every piece of marble, every sconce and finish… I wanted to transport the decor to my own home! The food is quite original both in presentation and in preparation. Buccanos uses Adoba, a marinade thought to originate in Spain and Portugal, in many of their offerings. Adoba is made of paprika, oregano, salt, garlic, and vinegar, and to top it off, they use Adoba-Coffee rub with fish and chicken. It is a rich flavor I’ve never tasted before, but I certainly plan to taste it again. As I said, their menu is surprising, trendy yet original. Buccanos at Night can be a little difficult to find, but it is well worth the effort. An absolute must for dining in Cozumel! These hidden foodie haunts are just two of the culinary treasures you will find on the island, but in my experience, they are two of the very best of what Cozumel has to offer. The island now has world-class dining, and in casual, yet romantic, settings. Cozumel isn’t just for divers anymore… foodies are falling in love.